The Hamsa: What Does it Mean? 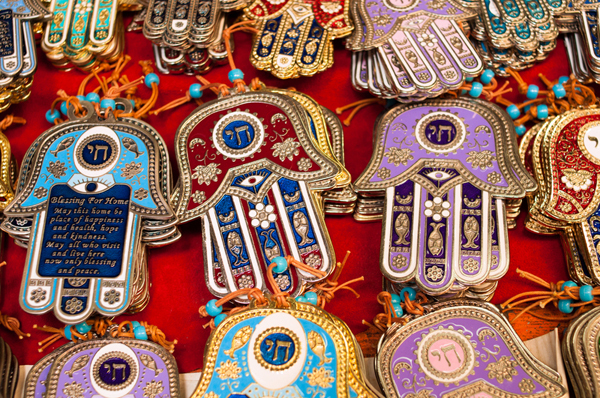 If you’ve traveled in the Middle East no doubt you have seen the hamsa, a talisman in the shape of an open hand. The name is related to the word for ‘five’ in Hebrew (hamesh) and Arabic (khamsa). Five fingers on the hand raised in a “STOP, in the Naaame of Love” or “Talk to the HAND” gesture make a powerful defense against evil-eye generated mischief and also bring good luck. Beautiful, stylized hands are everywhere in the Middle East and North Africa, especially in Israel, adorning homes and bodies. Hamsas often include extra protective elements in the palm, like an eye, bits of scripture or fish (believed to be immune to the evil eye). Hamsa origins are deep and murky. Magically protective hands have been found in ancient Egyptian and Mesopotamian artefacts. And what about all those hands in prehistoric cave paintings? In Sephardic Jewish tradition, the symbol may begin in Medieval Kabbalah, where it represented the hand of God. The hamsa may also be called the hand of Fatima (daughter of Mohammad), the hand of Miriam (sister of Moses) and the hand of Mary (mother of Jesus) and is sometimes associated with the Five Pillars of Islam and the five books of the Torah. By association with the hand, the number five is considered powerful. If you have a rabbit foot dangling from your key chain, add a hamsa for good measure. 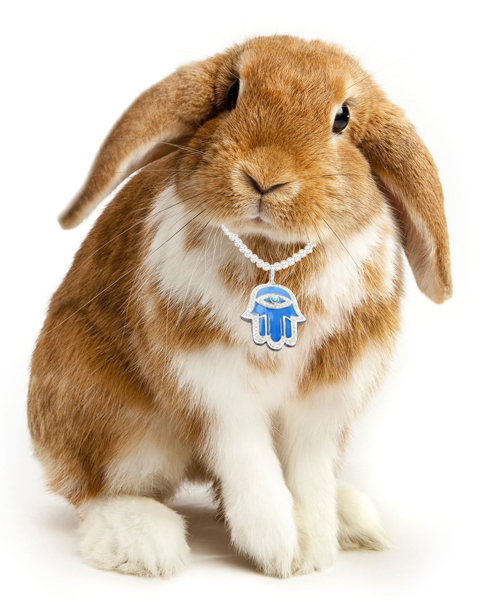 Better yet, convert to hamsa 100% and boycott the rabbit foot industry. Please don’t take my foot. This entry was posted in What Does it Mean? Enduring Symbols and tagged hamsa by yalla2013. Bookmark the permalink.